When I was in New York City recently, shooting had begun on the Nanny Diaries, based on the book by the same name, and starring Scarlett Johansson, Laura Linney and Alicia Keys. 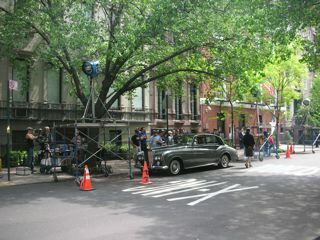 I didnât see any of the stars but I did get a shot of the fancy Bentley featured in the filmâacross the street I saw a stand-in for the movie nanny and a “little person”. All the trappings of the movie industry were thereâthe tables covered with catered food and parked on the street, I was amused by trailers with hastily scrawled names on the doors including âLuciâ?, âDesi â & âSingle momâ?. 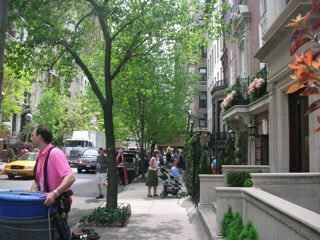 Later the same day, in another part of town, (photo below), I saw a commercial being made.